Please post here all the news related to that event. QMII is wearing a marine blue dress with a white top, that looks ... not really good. 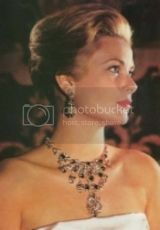 She wore it at Princess Alexandra of Berleburgs wedding also. Q Anne-Marie wore really nice rubies and a flower dress that I've seen before. I liked Q Silvias marine blue top. Princess Charlene is very pretty, she has fine sculptured features and looks very regal. That's how I've always felt about Kate's clothing, they are too pedestrian for my taste as far as being a Royal wife on the world stage. I'm not saying she has to dazzle every outing with couture, but everything Kate wears usually looks like something that can be bought in a department store. That is why when the best dress lists went up and Charlene was on it, I felt she deserved it, because she does dress very well usually and even if I sometimes don't like an outfit here and there, her clothes always look extremely well made, extremely well tailored and her clothes look more exclusive, but I think the Palace wants Kate to appear to be the somewhat Middleclass girl still. I think Kate dresses adequately but she always reminds me of the receptionist in a business office when I see her clothes. But.....I think Pr.William wants the Berkshire lass he brought home. He likes her to dress the way she does. If Kate started doing Courture, then William would eventually be turned off. I think that''s why she won't give her hair a bit more sleek sophistication, it would turn William off. I agree. I think the whole day has been a let-down. I loved the outfit of Morocco's princess Lalla Meryem : the kaftan look exquisite with the fine embroidery and the jewels: diamond studded belt (it's the real deal gal's not just Swarovsky strass) necklace and earrings are ) oh and look at the shoes! ^The caftan is absolutely magnificent. ^^^@SG - This should probably be over in the WK fashion thread, but I don't want to lose this train of thought (kinda busy in my world right now). Kill me later, Mods. SG, you're right. She's chosen the pedestrian route to undoubtedly please PW because she should be able to dress with a lot more panache than she does now and would probably be received much better and with more respect, so in essence she's being 'managed' badly. At the event today she could have been anybody's 'right hand' person. I can see that now. Her dress was, in retrospect, borderline secretary, woolen, EA, or downright housewife - boss - for - dinner wear. It took seeing Charlene for me to finally get it. She dressed for her position and did it again at tonight's event. It's regal, polished and slightly out of reach and definitely reflects her style and hers alone. As it should be. You dress for the job you want, right? Huge fashion Rule. However, there is the issue of whether or not you possess style. Charlene, Jackie O, PD, they could all be wearing blue jeans and a white shirt and still be a knockout, so part of her problem is just the fact that she's so underdeveloped. Interesting. First those shoes, now this: http://i46.tinypic.com/rh5rx5.jpg at least she's not boring. WK would look ridiculous in couture or polished clothes. She simply lacks the personality and sophistication to actually wear those type of clothes. Besides, her real problem isn't wearing the wrong clothes, it's that the position she's in is far too big for her. ^Yeah, that's some giddyup, but I'll bet that choker could pay for any one of us to not have to work for the rest of our lives, so who's laughing at whom? I read somewhere years ago that Pr.William thought Princess Caroline's daughter, Charlotte of Monaco was stunning, but he would NEVER pursue her romantically because she's too sophisticated for him. She would scare him. OK I'll take this to the PW random chat thread....but I think Kate is William's taste at this time in his life. A friend who wore gucci, prada etc. in high school when everyone else was in banana republic gap etc. even the really wealthy kids... said she wants a princess who has an elevated style... why be a princess if you are going to wear something that doesn't bring the room up. Yeah, we're this close to be yelled at, but either be a princess or get me a cup of coffee. Make up your mind, Kate. Very anti-climactic; there were the same royals they see all the time and the same faces and the same general outfits. There wasn't at all a huge parade of royals from around the world; no dethroned families like the Romanovs or the Hohenzollerns arriving en masse and no Indian princes and not too many Middle Eastern royalties and not too many who would make it really interesting. No real snazzy stylish outifts and no major jewels. Same with this dinner. As for Kate, I wodner how she feels not being at the dinner, but being at the lunch. Let's settle with 'reserved'. This has HM's fingerprints all over it and I'm sure she made it clear to keep it low-key. She is, I believe, ever-mindful of the prevailing politics and, actually, it was a smart move. There will be many other events that may or may not be criticized for being over-budgety. which doesn't bother the 'oil royals' like Brunei or the Emirates that much really but I guess they didn't want to offend their host by bringing out the big gun's. smart move of HM but for a royal watcher the lack of bling is a bit of a let-down.